Maybe they mean 'sidebar" not "sober", Petty? Something you'd find in a Scotshobbiton tavern when the main bar is busy and the patrons are becoming dangerously crabbit? How would an associate of Odo Banks know anything about disrespectable Scotshobbit taverns? I get around, Eldo, I get around. Clearly! I don't want to be in the area when Odo sees this. That makes sense Orwell- a sort of overflow facility for drinkers. Good idea if you ask me. We have similar things in Ozhobbitland, Petty. Only sensible. My name in the paper without some disparaging rumor about me? It... er... feels kind of nice, actually. Pretty claiming victory. Leelee claiming victory. I, of course, claim victory. And Eldo, too? Oh well, I guess Forumshire is the victor! I doubt its Pretty making the claim more like her editors-as long as she got her ususal payment of Lady's Buckie and a selection of hats and shoes mind I'm sure she's happy no matter what they say. Orwell wrote: I guess Forumshire is the victor! Orwell wrote: Pretty claiming victory. Leelee claiming victory. I, of course, claim victory. And Eldo, too? Oh well, I guess Forumshire is the victor! I never claimed victory, I only told the truth of what happened in the time frame it happened. As long as you darling Halflings got your stuff back I am very very happy. As long as the Taster gets his share of kind words, for it was not even two minutes later after my asking that I read his post and I am proud of him as well.By the way, is anything at all missing. My eyes are getting tired from all that exploring. Leelee, you didn't have to claim victory since we already knew it belongs to you. leelee wrote: By the way, is anything at all missing. My eyes are getting tired from all that exploring. Eldorion wrote: Leelee, you didn't have to claim victory since we already knew it belongs to you. Three day? That is grievous to me. Now I feel rather sad. But better what you have than nothing. Now I shall always wonder what wit, what intelligence and thought provoking material was lost in space. leelee wrote: Three day? That is grievous to me. Now I feel rather sad. But better what you have than nothing. Now I shall always wonder what wit, what intelligence and thought provoking material was lost in space. Please don't worry about it; three days out of 27 months really doesn't matter. Besides, all of the threads that I really missed have been preserved intact. 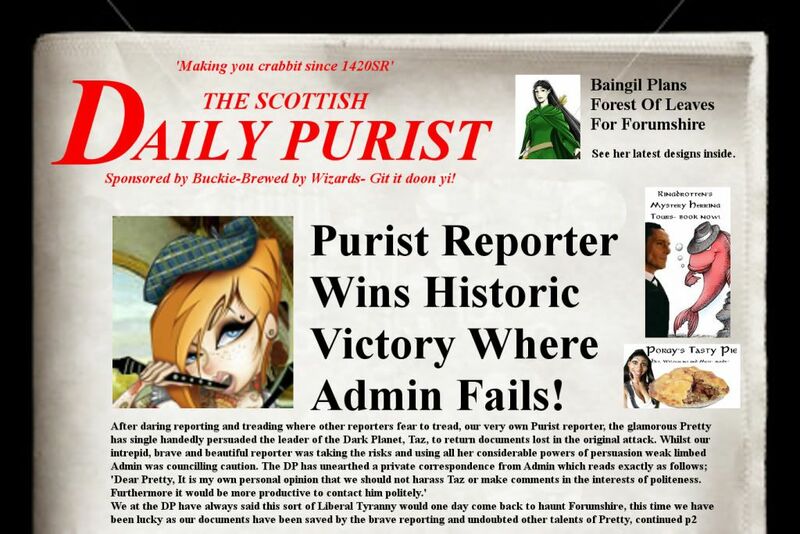 Celebrating our 15th Edition of the Daily Purist! Can't we just try again with another thread????? Keep hitting this "overlord" wave after wave until he breaks down!!!!!!!!!!!!!!! I have a recurring dream, even when I'm awake, that people are calling me Neville Chamberlain behind my back! 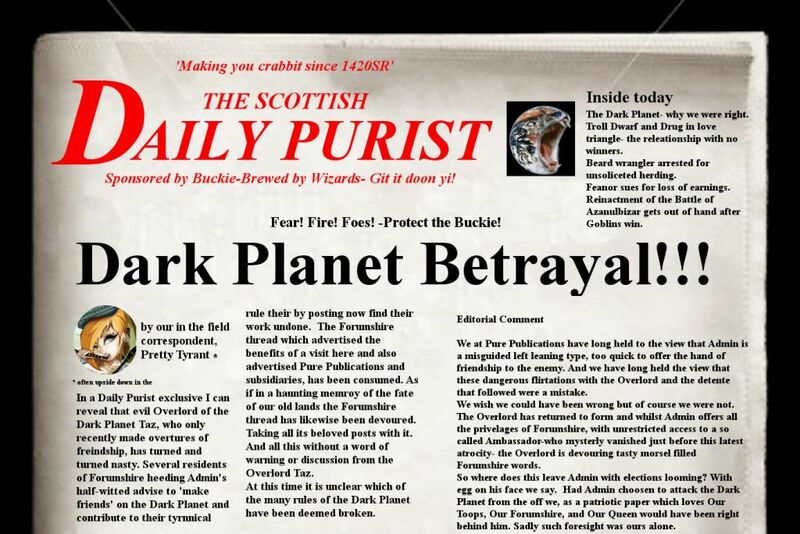 Pettytyrant101 wrote: Celebrating our 15th Edition of the Daily Purist! Pretty, are you referring to me in your article? I ask because somewhere I believe someone called me an ambassador. As a free lance writer and former women's editor of a small city newspaper, I can tell you that before you write an accusation it is customary and in the world apart from Middle-Earth,to get your facts straight by talking the anyone you will write about. I had only intended to ever come on only very rarely to see how you all were, but I fell in love with you all, your personalities, your love and devotion to one another. And when I understood the nature of your bitterness and hurt I approached Taz who is a good and fine person and asked if you could have your property back. And he unhesitatingly gave it. You read or knew of the rules and the only thing I ever asked is that you warn those who might be offended such as very young participants. I did not and do not feel that is wrong or unreasonable a request. I did not leave for any other reason. I am so busy and pressed for time and just cannot devote myself to both places. Have you asked Taz for this back, all the comments you made on Forumshire? Because if not, that is very unfair and unkind to put into print these words, even if tongue in cheek. Tongue in cheek is often just veiled hostility and I don't know you so I hope this is not the case. And , if anything is pertaining to me I would have been very grateful to you if you would have just messaged me over there and I would have answered you anything you wanted of me. Even we at Planet Tolkien have feelings and if you say dont take anything too seriously , while I agree with that, I also think words can truly wound, even in jest. I did all I could for you, because you did and do and probably now since I have met some of you, always will matter a great deal to me. I never once asked that your thread be deleted or anything else. As i said I only asked that there be a caveat about the age groups reading some of the material. In missing the humour you miss the point, leelee. Petty leaves none of us unscathed --- but we can laugh at ourselves. That's the thing that we most share here, an ability to laugh at ourselves. Mind you, we laugh more often at the outlandish accusations made against each other, not very much of what we say is based on facts about each other. We know many comments are outlandish, that also is the joke! Believe it or not, no one deliberately seeks to hurt others. It's about laughter. Shared laughter, and not condescension (except for feigned condescension). As to child protection, I spend my days warning my kids to carefully assess Puritans. Puritans and Pharisees are often the same thing. I am bringing my children up to think for themselves and to face the world as logically as possible, and to not be burdened by the views of people whose own morals come down to them from on high from a God whose actual existence (except in the imagination) is speculative to say the least. I find your moralising insulting. Have your opinons, but remember, that's all they are. If you want to moralise here, feel free, but know that what you sow is what you reap, in this case, be prepared to take receipt of other people's moral views. We laugh here but we also have serious discussions as well. That's what Free Spirits do. leelee there is of course no intention to offend. Orwell puts it well when he says its about laughing at ourselves. And the Daily Purist and the News of the Pure are satires of a particular type of nasty tabloid journalism which twists facts to fit narratives they largely make up themsleves. This is exactly what the newspapers on this forum do- its for fun, its to entertain and occasionally to make a point- not in the content of the stories themselves but in the manner in which they are told. Sadly a joke explained is not a joke gotten. If you wish to take offense there will be offence to find if you look for it, but just because you perceive an offense it is no indication that the originator intended any. -And one would hope that the content of the newspapers is so obvioulsy over the top and tongue in cheek that no one would ever take it seriously, let alone take offence at it. But I guess if people want to be offended they will be no matter what. If they weren't tongue-in-cheek I'd be highly offended. And that would be an understatement. Gaining weight indeed. Orwell wrote: I have a recurring dream, even when I'm awake, that people are calling me Neville Chamberlain behind my back!